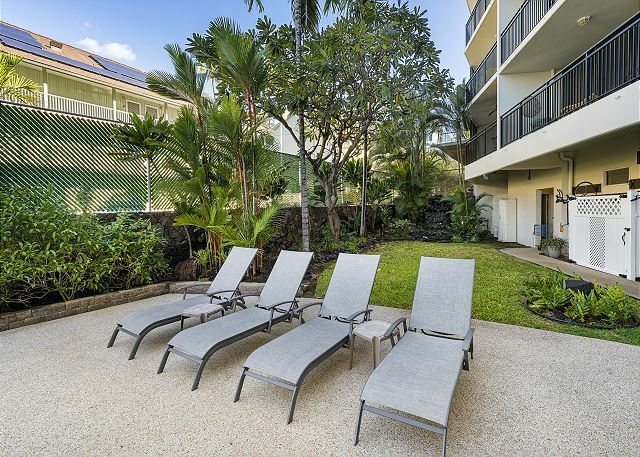 The Kona Alii complex is located right in the heart of Kailua Kona. Enjoy waking up to the crashing ocean with a cup of world famous Kona Coffee! 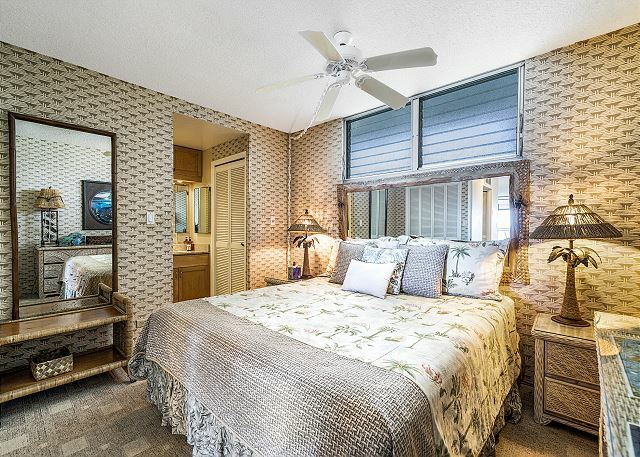 This 1 bedroom enjoys the ocean sounds through out. A pull down bed in the living area allows for additional sleeping for two. Upgraded unit that is well appointed. Enjoy one of the largest pools in Kona at this community. Conveniently located in the heart downtown Kailua Kona. Explore downtown historic Kailua Kona. The town of Kailua Kona "hides" some very important Hawaii Island historic spots. Both the Hulihee Palace and the Mokuaikaua Church are located on Alii Drive. King Kamehameha I spent his last years living near the current site of the King Kamehameha's Kona Beach Hotel until his passing in 1819. The Ahuena Heiau, located on the grounds of the hotel, is a reconstructed temple rebuilt by Kamehameha himself and is on the register of National Historic Landmarks. Mahalo nui loa, for your review of Kona Ali'i 504. We are delighted to hear that you have found your stay outstanding as always! We look forward to your return to the Big Island using our coveted repeat visitor rates! We're sorry to hear that the lobby construction was occurring during your stay and negatively impacted your opinion of the complex. We sincerely hope you;ll return allowing us the opportunity to improve your opinion! We really enjoyed our stay in Kona. We've visited several times and have stayed in the same area but really enjoyed this condo. It was central to everything we wanted to do in Kona. We enjoyed the view of the ocean with all of the spinner dolphins and it was very soothing to fall asleep to the sounds of waves crashing below. A couple of times we were woken up by folks talking loudly in the hallway outside the bedroom window a bit early but otherwise I would highly recommend the condo. We will definitely look into staying here on our next visit. We have personally seen those very same spinner dolphins from this Lanai, it is absolutely breathtaking. We're happy to hear they put on a show for you, during your stay! We hope you will contact us directly for your next visit so we can offer you a returning client discount! Fab view, excellent position close to the shops and restaurants, undercover parking. A bit dated and ol fashioned decor. We're happy to hear the location and view out shined some stylistic points of the unit. We will recommend some upgrades be made to the areas mentioned. Condo is in a great location and has beautiful views of the ocean. 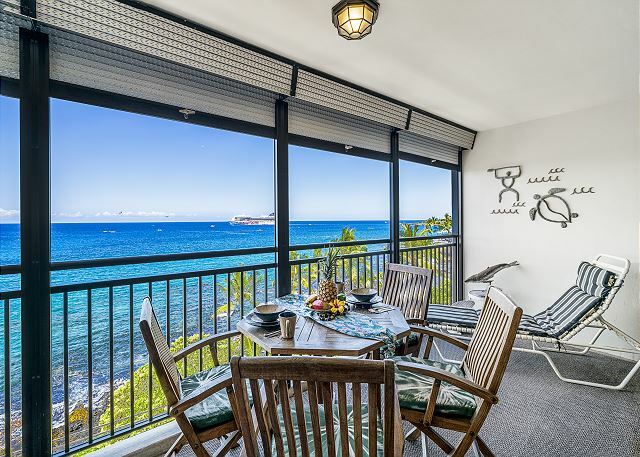 Can be very loud with street noise at night with the Lanai doors open for the sea breeze to cool things down. Condo is a bit on the dark and dated side. Aloha and thank you for leaving your feedback. 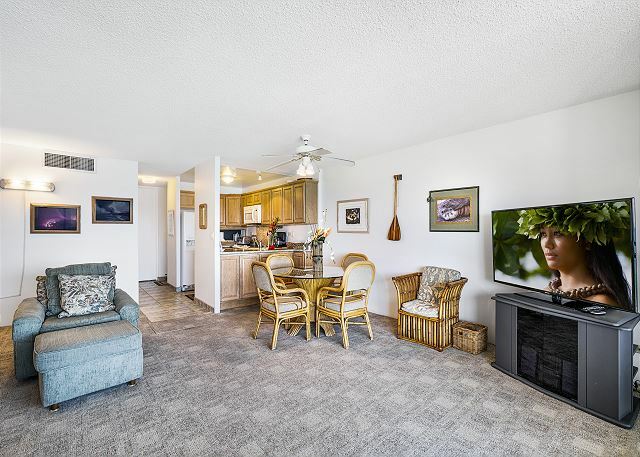 We apologize that this condo didn't meet your expectations this time, but we would be happy to explore some options that better fit your needs for the next visit. 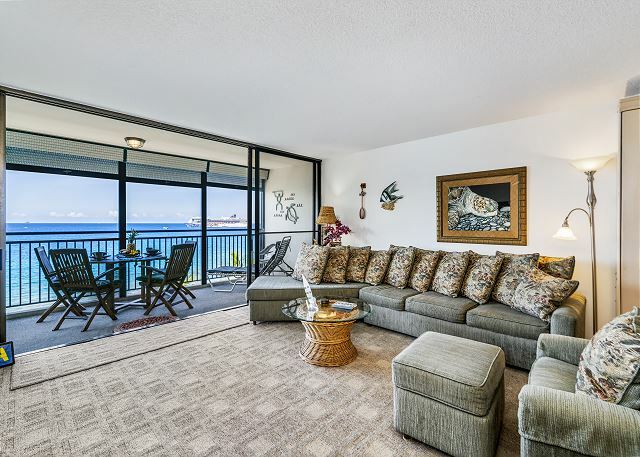 This condo is best suited for someone looking for an ocean view, crashing waves and easy walking access downtown. Ali'i Drive runs in front of the building and although it is only 15 MPH downtown, there is quite a bit of activity, which can understandably cause some noise issues in the early evening. We fell in love with the amazing view. It was great being in downtown Kona where we could walk to the Farmers Market and local restaurants. Aloha, thank you for taking the time to leave a review. Please come back anytime for more sunshine and sunsets! Remember, returning guests receive a 10% discount on reservations booked directly through our office or website. As always outstanding. This was our 11th yr. plan on May more. Thank you for taking the time to leave feedback. We are always happy to welcome you back! 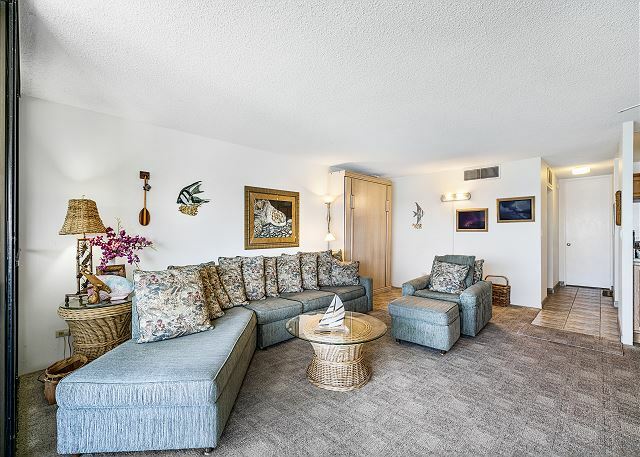 Great Condo on the water with a great view and wonderful sunsets. Close to everything but just far enough from the crowds. Condo itself was well-stocked, clean and homey. If I return, this would be the one I'd ask for. 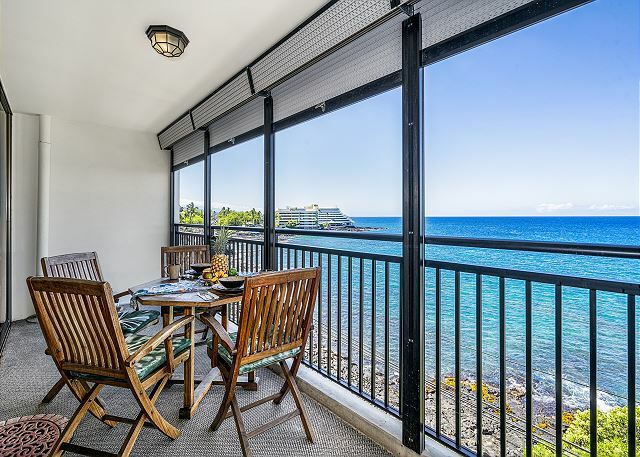 No AC but good evening breeze and pull downs on the lanai to block out the sun while you are out at the volcano or snorkeling among the reef fish and sea turtles. Had a wonderful time in this remarkable condo. Everything was exactly as described on the site but better. Great digs, pool, view, convenient to amenities. We'll be back! Amazing location! 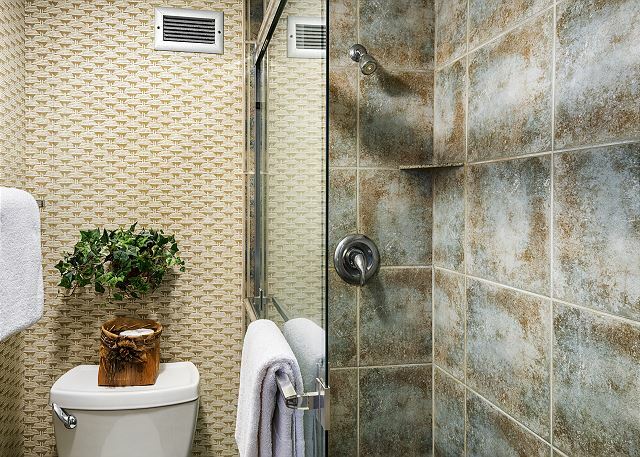 Convenient for walking to numerous restaurants, shops, farmers market. Total ocean view from condo for watching sunrise with a cup of Kona coffee and relaxing to a romantic sunset in the evening. All of this and you hear the wonderful ocean waves throughout this oasis. The pool is large enough for swimming laps or just a cool down relaxed environment. Morning and afternoon sun affords all day Vitamin D therapy. 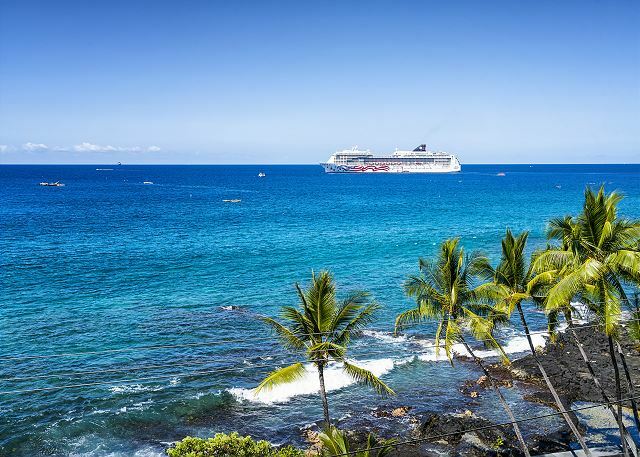 Ocean swimming is just a short walk away. Very comfortable home away from home! Have stayed in this condo a number of times and would definitely stay again. We absolutely love the location. Over the years the furniture has gotten a little worn. Would love to have an end-table between sofa and large chair as there is no place to sit (for example) a glass of wine. Overall, plan to be back. Great condo. Great location. Would stay here again. Excellent experience, will definitely return! 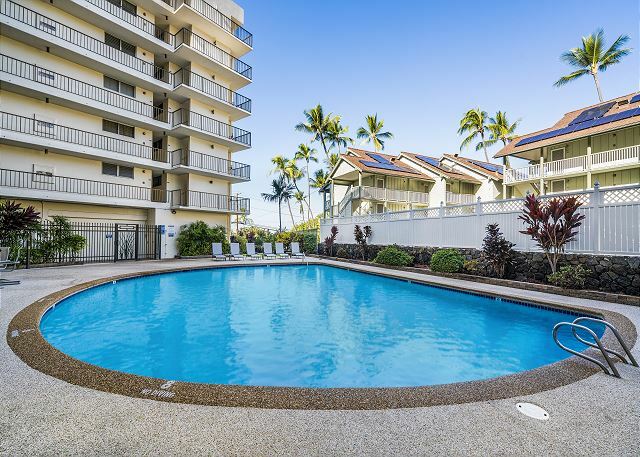 Very pleasant unit...well-equipped, functional, GREAT views, perfect location for Kailua-Kona activities, great parking arrangement, lovely pool area...We stay annually from ten to fourteen days. This was our third rental of #504. We had a nice visit and the accommodations were very nice. This was our first visit to Kona so it was in a good location to see the entire island. We typically stay on the Kohala Coast or near Keauhou Bay but made the decision to stay at Kona Alii 504 for 8 days. It exceeded our expectation. Given the fact that it is literally in the heart of Kona it felt quite and peaceful in the unit. We loved sitting on the lanai morning, afternoon and night. 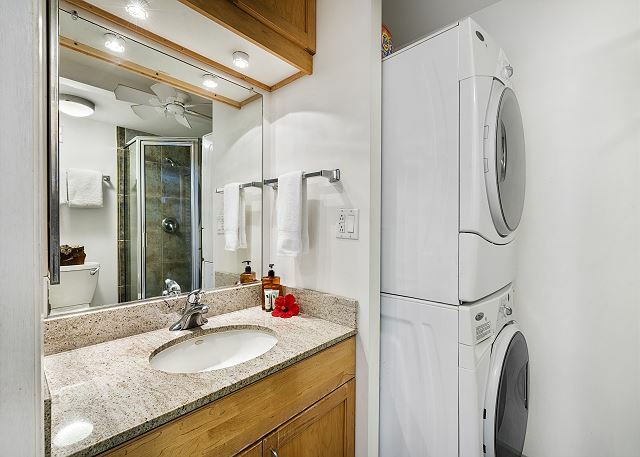 Parking is easy, the unit is comfortable and everything we needed was readily available. 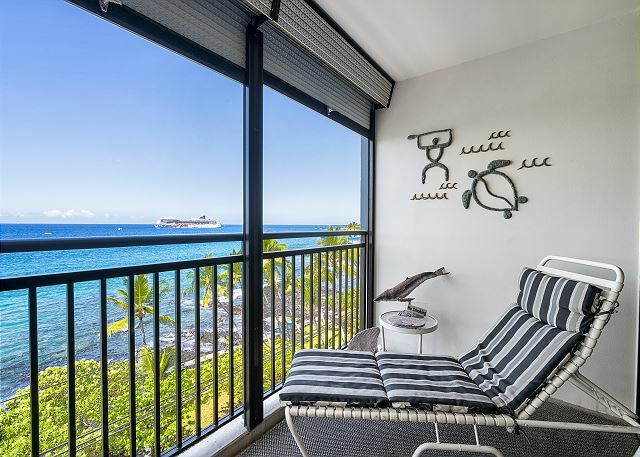 If you are looking for luxury and a resort environment you may not want to stay in downtown Kona, but if you want convenience along with comfort until 504 is highly recommended. We are recommending it to our friends. A wonderful condo overlooking the shore. A great balcony to hear the surf and watch the waves. 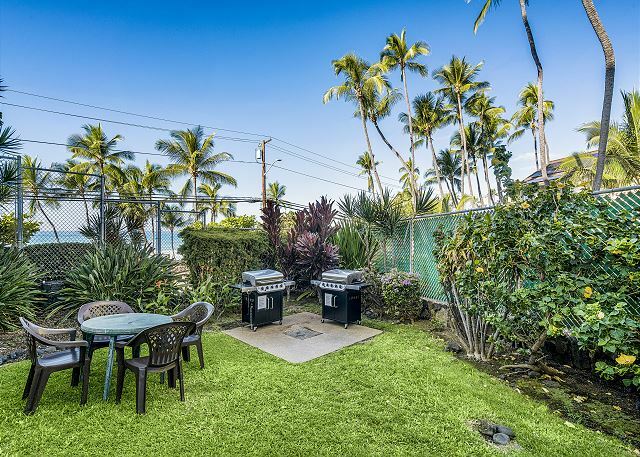 Easy walking distance to many great places of Kona. A beautiful, comfortable and well managed location. We really enjoyed our time here. Relaxing, fun, and a feel of home. Our condo was so comfortable( except we need one reclining chair) and everything worked and if not was fixed quickly. The office staff was so accommodating and helpful. Ill be repeating my stay as soon as possible. Awesome spot. This is our second stay here. It was not as clean as last year. Spot on the carpet as you walk into living room. The kitchen floor needed some additional cleaning. The lanai would be so much cleaner if it was tile. the birds like to come and it gets wet in the rain. Overall we love the condo and will stay again. Excellent. My son didn't leave the Condo for three days because he just wanted to relax and said the view was fantastic. Perfect location. The area has almost everything you need within a short walking distance. Although beaches and snorkeling areas were close, we did rent a vehicle to get to some of the beaches and snorkel areas north and south of Kona. Anna Marie was five star in putting together our vacation rental package. She was always cheerful very knowledgeable and returned every phone call and answered every question we had. Thanks for a great stay. 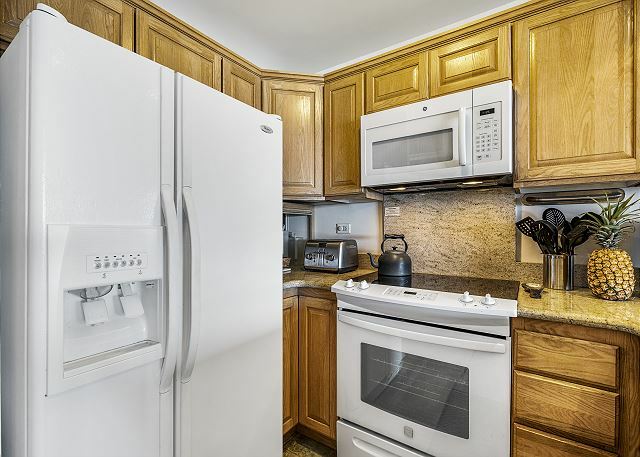 Absolutely no storage in kitchen for groceries, other than refridgerator. Everything else sits on limited counter place, maybe some of the 42 glasses could be stored in the storage facility on each floor. There were 3 of us staying in condo. Daughter slept on murphy bed. No storage there for her clothes, we had to double up in the dresser in master bedroom. We have used murphy beds before and there were drawers and closet space in the frame work around murphy bed. WE had a great week...THe view was so beautiful we hated to go out and do things. We had two condos-the other one being two floors below. Great week... Highly recommend. We had a wonderful stay & got our bearings very quickly. Condo 504 is very spacious & well equipped. Great views from the entire unit (even the bedroom if you leave the door open. And even though there is no AC - the cross breezes are perfect. All the fun places are incredibly close (Lava Java in particular - great coffees & great ocean view breakfasts). They have free wi-fi (the condo doesn't). Saw dolphin almost every other day - swimming in the bay with humans training for the Ironman. Amazing beaches about 1/3 hr away (Makalawena is worth the 1/2 mile hike over lava bed). Weather was a constant 79-81 degrees - just a few sprinkles during our 2 weeks there (one short period of massive downpour). Thought we'd see all of the island but stayed Kona & north. Again - no wi-fi in the unit - so you have to spend some quality time @ Lava Java if you need to connect (I-pads & the like excluded). Weekends can be fun - but if you retire early - the party crowd is 5 stories below on the streets - till 2:30-3:00 am. All in all - great time in Kona @ Kona Alii 504! We were not happy that we could not use a credit card for the rental unless we paid a fee. That seems unusual for a rental company. and there are way too many glasses and dishes. There was nowhere to put canned goods and we stayed six weeks! Nicest one bedroom we have ever stayed in. It only lacked a bathroom scale but has one now. We've stayed in this unit several times, and have always loved it. Nothing much has changed. Everything was great -- except the sheets and matress protector had plainly not been changed when we went in, which is really out of character for this owner. The Property Mgmt. was wonderful and very helpful. We return every year to the same condo. Very happy with it all! We love the condo. Would not stay in any other on the property. We were VERY disappointed in the fact that the shades were not put up. They were not up last year either. The ongoing renovation was noisy and disruptive to an otherwise peaceful and much needed vacation. The lounge chairs on the 7th floor sundeck need to be replaced. The flooring on the deck is DANGEROUS. We see how the owners are wanting to improve the property. I hope those improvements are included. As a result of ongoing work, with a worker jumping onto our lanai and NO shades/curtains to protect our privacy, we were forced to consider our dress attire and other such private matters at least 8 hours a day. For a married couple, that is NOT the best situation while on vacation. I will say that the contact (Susan McKay) was as helpful as she could be. I understand that some things are out of her control. I would NOT recommend all condos at this property. We have had the displeasure of staying in two different ones before #504. But I would trust the agent, Susan, to find a place worthy of the prices that are charged. Kona ALii needs disable access to Alii Drive, It is too steeo and sangerus to go through the parking kt.